Facebook advertising spend has skyrocketed over the past 2 years. With the detailed targeting available to advertisers and very reasonable costs associated it’s easy to see why it’s fast becoming the go to method for paid content promotion. But what are the most effective targeting methods? Here’s a few ideas. The obvious answer is both. You need good imagery and CTA’s in order to be able to drive clicks and engagements with your ads. If however, your ads aren’t quite working, it’s more likely that your targeting is off and not your creative. You can A/B test your ads to death using slightly different images and text but if your targeting the wrong people then you’re always going to struggle. That’s why for us, targeting and relevancy of content is absolutely key in successful Facebook advertising. Age, gender and location are good places to start and you should already have an idea of your target demographics before you go into any paid social. Your targeting shouldn’t stop there though. The best Facebook adverts target users with relevant content based on their passions, interest sets and their current situations. The below example would be a suitable audience to target prenatal nutritional supplements to as they have expressed an interest in relevant media and suitable terms. Even if this audience is no longer in the same situation as the above criteria suggests i.e. they are no longer pregnant, they are still your advocates for amplifying your content. People like talking about themselves and bringing other people they know into a conversation via recommendations, personal situations and passions. 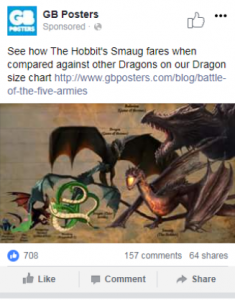 With the below example, we had created a dragon size chart that compared Smaug from the Hobbit franchise to other film and TV dragons. We promoted this to people who were fans of the Hobbit – simple. It reached over 200,000 people and had an engagement rate of 10%. Purely because it ticked all the right boxes. It was interesting content, going to a highly relevant audience who have already expressed an interest in the subject. Put yourself in the shoes of someone who’s never heard of your brand before? Would you buy something off a company you’ve never heard of before? Or is it more likely you would buy from a brand that you’ve engaged with a few times at least? This is why cold, ‘buy this’ type facebook advertisements are rarely successful. It doesn’t mean you can’t drive sales using facebook, it just needs to be done at the right time. Content comes first, get them into your site or engaging with your posts using what Facebook was made for. Then think about how you can stay front of mind and eventually convert them into customers and advocates. Such techniques include…. Retargeting through Facebook can be a really effective way of eventually converting people who’ve already engaged with your site into customers. It involves dropping Facebook pixels onto your site or certain areas of your site, depending on how specific you want to get. Using the above dragon size chart again. Are the 8,000 Hobbit fans who visited this piece of content also likely to be interested in Hobbit merchandise? A % certainly will be. So once they have engaged you can retarget them with product level advertisements, safe in the knowledge that a) They have already engaged with your brand and b) they are a highly relevant audience who are interested in this subject area. If you have an email database of newsletter subscribers then you can upload this list as a custom audience in Facebook. This allows you to be able to target your database on a new platform. As these are either likely to be existing customers or people who have signed up for a mailing list, they are more likely to buy from you than new audiences. So you can be more commercial with your social ads that target these audiences, but good quality content also works well in a bid to keep front of mind with them and build up a rapport. After all, this kind of audience are likely to be your advocates when it comes to sharing and generating discussions across Facebook. FYI – Targeting a database works better for a B2C type audience as their email addresses are more likely to be linked to a Facebook account whereas B2B audiences tend to use their work emails to sign up for newsletters and these are unlikely to be linked to a Facebook account.